1）厚生労働省：健康日本21 歯の健康. 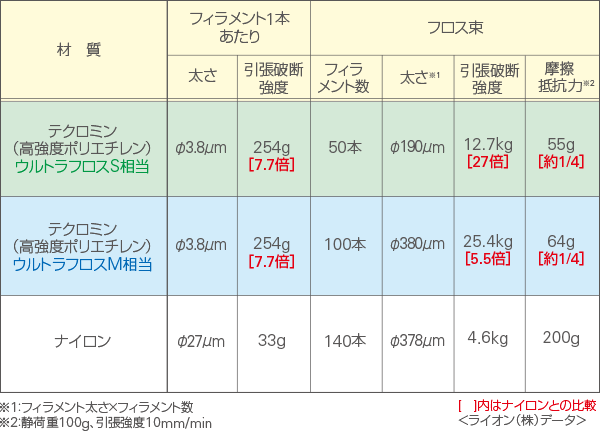 http://www1.mhlw.go.jp/topics/kenko21_11/b6.html#A63，Accessed for Apr 16, 2016. 2）厚生省大臣官房統計情報部：歯間部清掃用器具の使用状況．http://www1.mhlw.go.jp/toukei/h11hftyosa_8/kekka5.html，Accessed for Apr 16, 2016. 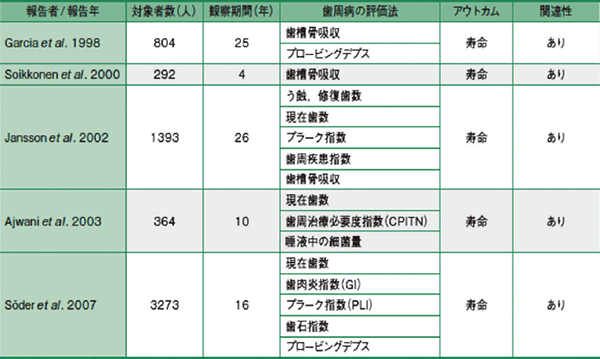 3）厚生労働省：平成22年国民健康・栄養調査結 果の概要．http://www.mhlw.go.jp/stf/houdou/2r98520000020qbb.html，Accessed for May 23, 2016. 4）Beck J, Garcia R, Heiss G, Vokonas PS, Offenbacher S.: Periodontal disease and cardiovascular disease. J Periodontol, 67(Suppl):1123-1137, 1996. 6）Dumitrescu AL, Inagaki K.: Interrelationships between periodontal disease and mortality, cardiovascular disease, metabolic syndrome, diabetes mellitus, Dumitrescu AL. Etiology and Pathogenesis of Periodontal Disease, 1st ed, Springer, Germany, 2010, 125-157. 7）若井建志，内藤真理子，川村　孝，内藤　徹，小島正彰，梅村長生，横田　誠，花田信弘：歯科医師を対象とした歯と全身の健康、栄養との関連に関する研究．8020，15:114-115, 2016. 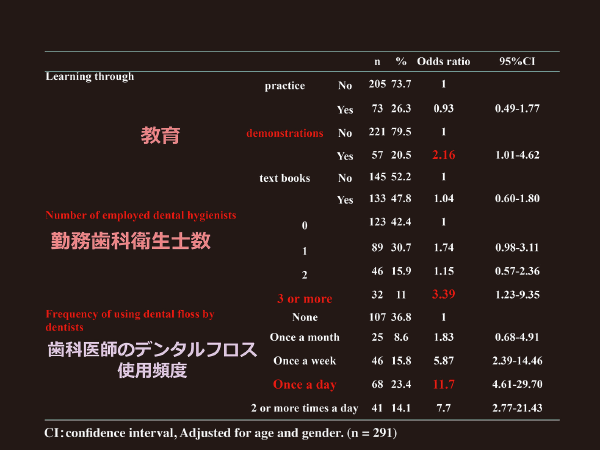 8）Nakamura F, Hirayama Y, Morita I, Nakagaki H.: Factors associated with Japanese dentists encouraging patients to use dental floss. Community Dent Health, 28(1):111-115, 2011. 9）Sambunjak D, Nickerson JW, Poklepovic T, Johnson TM, Imai P, Tugwell P, Worthington HV. 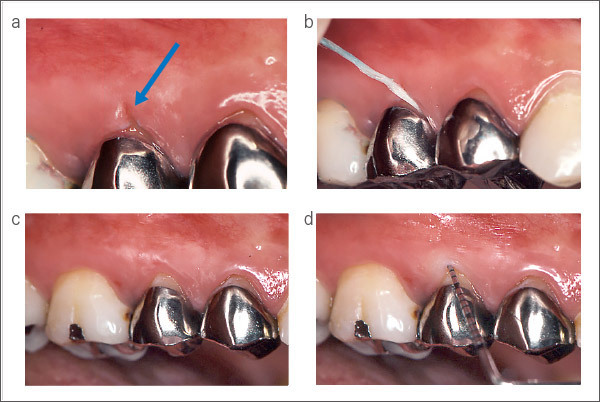 : Flossing for the management of periodontal diseases and dental caries in adults. Cochrane DatabaseSyst Rev, 2011;(12):CD008829. doi: 10.1002/14651858.CD008829.pub2. 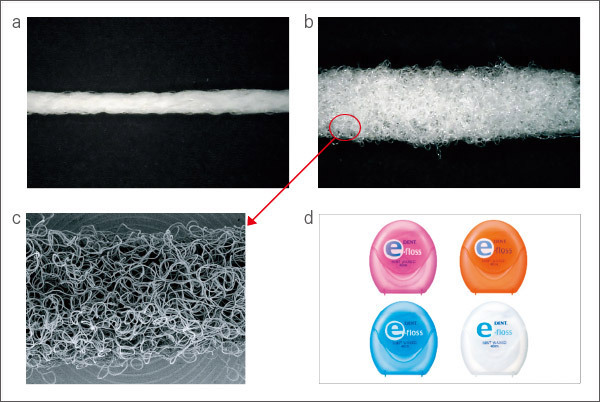 10）Donn J.: Medical benefits of dental floss unproven. http://bigstory.ap.org/article/f7e66079d9ba4b4985d7af350619a9e3/medical-benefits-dentalfloss-unproven，Accessed for Oct 23, 2016. 11）Mole B.: Dentists forgot to study flossing for a century, recommended it anyway. http://arstechnica.com/science/2016/08/dentists-forgot-to-study-flossing-for-a-century-recommended-it-anyway/，Accessed for Oct 23, 2016. 12）Salas ML, McClellan AC, MacNeill SR, Satheesh KM, Cobb CM. : Interproximal cervical lesions caused by incorrect flossing technique. Int J Dent Hyg, 10(2):83-85, 2012. 13）Walters JD, Chang EI. 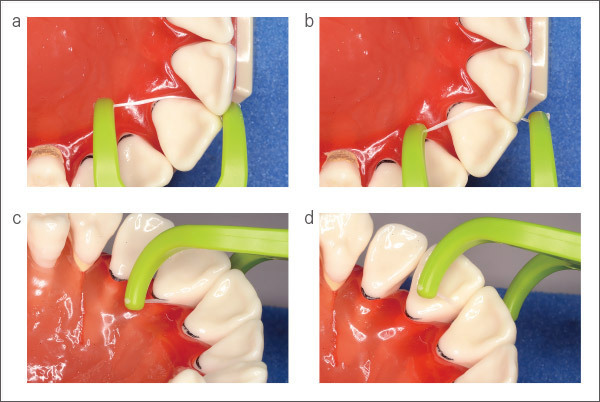 : Periodontal bone loss associated with an improper flossing technique: a case report. Int J Dent Hyg, 1(2):115-119, 2003.